After receiving my wonderful delivery of ink from CultPens the fun could really begin. Time to carefully transfer the bottled ink to my primed and ready empty cross cartridge. I started off by making sure that my 2ml syringe was clean and dry. 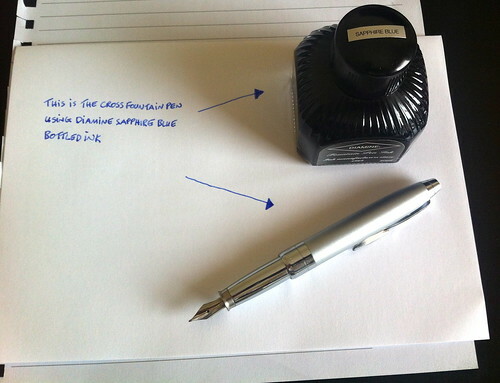 Then I opened the Diamine Blue Sapphire bottle and dipped the needle of the syringe in to the ink. Pulling on the plunger brought ink up in to the syringe. From this part on I needed my glasses as I wanted to ensure that I actually was putting the needle of the syringe in to the empty cartridge and not about to cover me or my table in Blue Sapphire ink! I pushed the plunger just until I saw that the cartridge was nearly full. 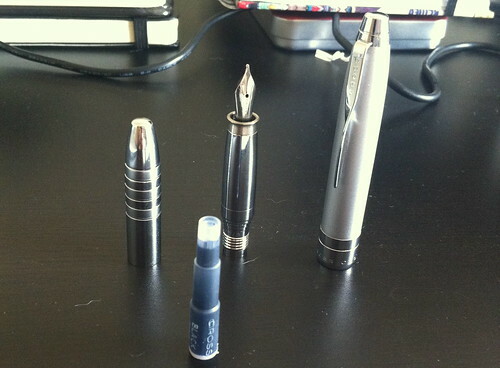 I then clicked the filled cartridge into the cross fountain pen and proceed to screw all the parts back together too. Taking out my trusted Spiderman notebook I began testing the Cross pen to have it produce the ink correctly. It took a few minutes until it started to produce a watery pale blue ink though this may be because I may not have let the Cross Fountain pen dry out properly. After a few more writing attempts, the watery pale blue was replaced my a much stronger blue until it was producing the correct Blue Sapphire colour. Overall I found this experience to be very enjoyable. I think a big factor to attempting this is to just be patience. Everyone should give this ago at least once and now that I feel comfortable doing this I can't wait to buy some more wonderful ink colours for my Cross which has received a new lease of life!